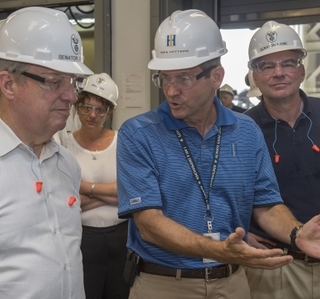 NEWPORT NEWS, Va., July 20, 2015 (GLOBE NEWSWIRE) -- Huntington Ingalls Industries (NYSE:HII) today hosted U.S. Sens. 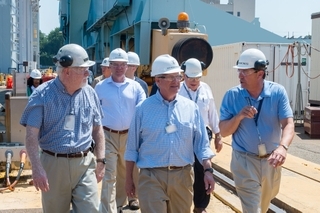 Tim Kaine, D-Va., and Roger Wicker, R-Miss., for a tour of the company's Newport News Shipbuilding division. 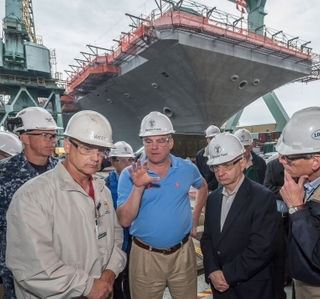 The senators met with shipbuilders and discussed the shipyard's increased efficiencies and construction progress on the aircraft carriers Gerald R. Ford (CVN 78) and John F. Kennedy (CVN 79). They also received progress updates on the Virginia-class submarine program, the refueling and complex overhaul (RCOH) of the aircraft carrier USS Abraham Lincoln (CVN 72), and the inactivation of the aircraft carrier USS Enterprise (CVN 65). "America's Armed Forces require the best technology and tools available to complete their missions," said Wicker, whose state is home to Newport News' sister shipyard, Ingalls Shipbuilding. "Huntington Ingalls Industries produces the world's most sophisticated ships, enabling our troops to remain the most well-equipped military power on Earth." Wicker has represented Mississippi in the Senate since 2007. Prior to joining the Senate, he was first elected to represent Mississippi's 1st Congressional District in the House of Representatives in 1994. He is a senior member of the Armed Services Committee and chairs the Subcommittee on Seapower. Kaine was elected to the Senate in 2012 and is a member of the Armed Services Committee. The former Virginia governor has been a strong advocate for Newport News Shipbuilding. Last year he worked to secure funding for the refueling and overhaul of the USS George Washington (CVN 73). "I have the benefit of visiting the shipyard on a fairly regular basis, so I can appreciate the tremendous progress being made on all of the ships across the shipyard, but especially Gerald R. Ford," Kaine said. "Senator Wicker shares my interest in shipbuilding, so I was happy to join him to meet with our shipbuilders and see first-hand all of the cost-reduction efforts being made so that we can continue making smart investments in our national security." 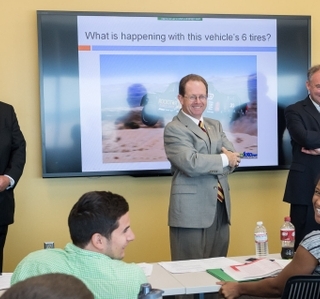 Ford is about 92 percent complete and is scheduled for delivery to the U.S. Navy next year. The Lincoln RCOH is about 72 percent complete, and the ship is on track to redeliver in fall 2016. The Enterprise inactivation is about 57 percent complete.